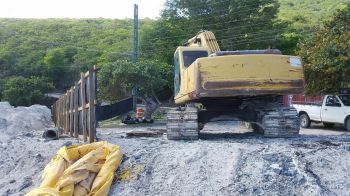 Speaking to this news site yesterday November 9, 2015 Chief Planner at the Town and Country Planning Department Gregory W. Adams said the plans for the development works are yet to be approved. 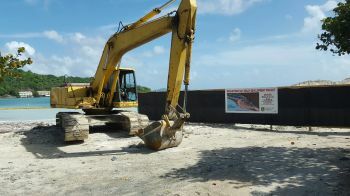 “Just as I have told everyone else the plans for that development have not been approved by the planning authority,” he said. 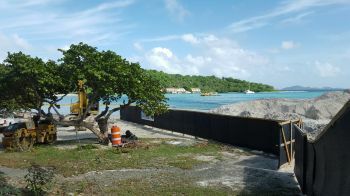 Asked what was going to happen as a result of the works being executed in the absence of the Town and Country Planning Department’s approval, Adams said it is difficult for him to say. 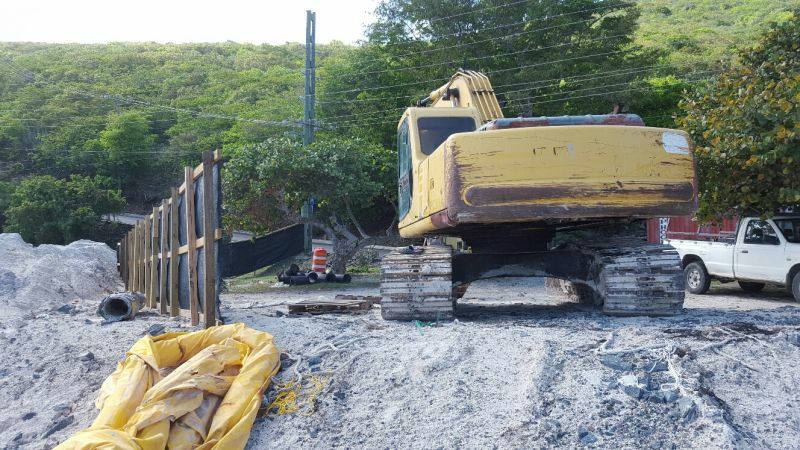 “We have done our investigations and we have communicated all information to the Ministry of Natural Resources [and Labour] which is responsible for the project,” he said. According to Adams, once they get the information that has been requested it will be processed and a decision will be made by the authorities. He noted too that a stop work order is something that is under consideration also. “It is difficult for me to say at this point what the outcome will be,” said Adams. 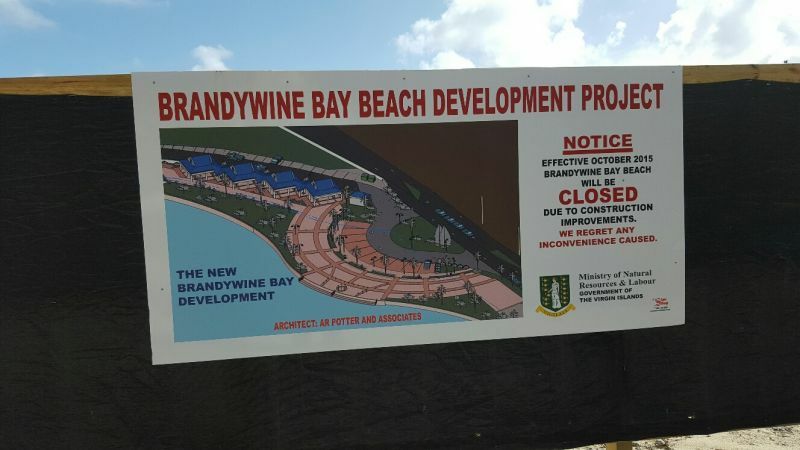 A check with the Department of Conservation and Fisheries revealed that that department had nothing to do with any permitting for the Brandywine Bay project. 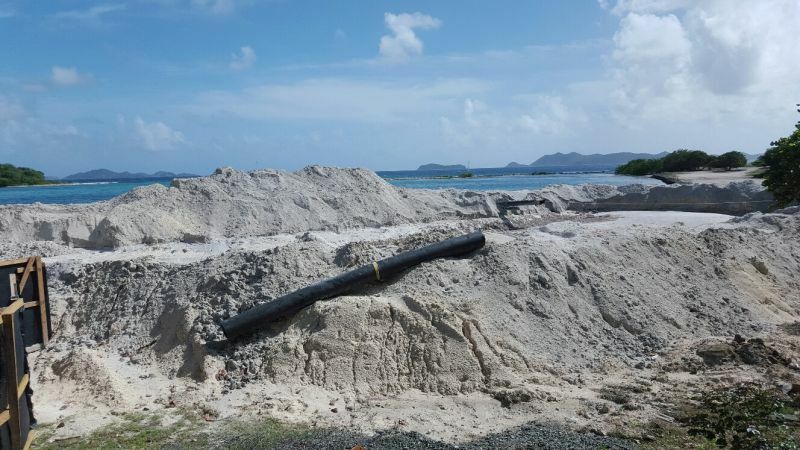 Attempts to reach officials from the Ministry of Natural Resources on the project proved futile up to press time. 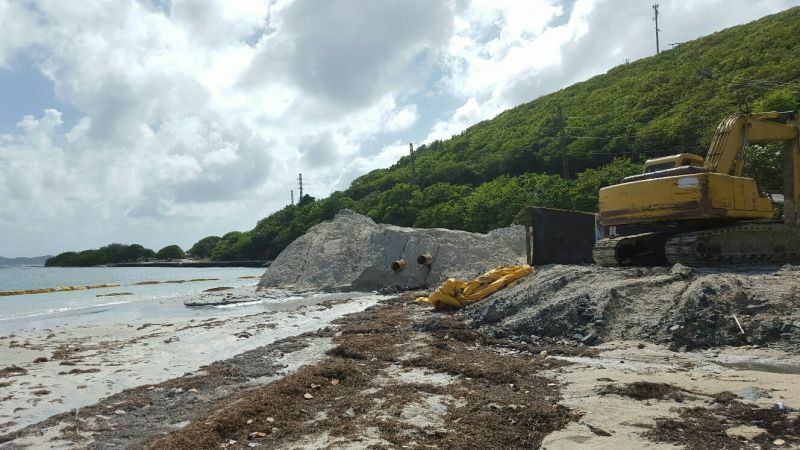 Residents of the area complained when the first loads of sand started dropping in late October 2015. When this news site visited the project site at Brandywine Bay yesterday, November 9, 2015 the project seemed well underway with lots of earth-moving equipment and signage indicating that it was a work in progress. Loads of white sand had been placed on the area of the development as it appears that a portion of the sea will be filled in to make space for the planned development. 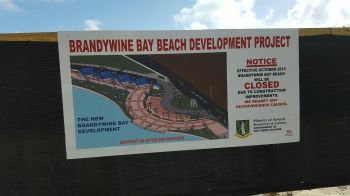 It is unclear whether the development works will have any major environmental impact to the beach at Brandywine Bay. The sign also shows an artist’s impression from architects A. R. Potter and Associates of what the finished works would look like and features a series of buildings, parking spaces and a terrace making for an inviting setting for tourists and residents alike. We will continue to follow this story and bring updates as more information becomes available. don't even try to compare this with the sea cows bay project, its like apple to oranges, this development has to be and done now, and that's the bottom line, we taxi drivers need alternatives to take our cruise ship passengers, plus bruise bay and cane garden bay needs the ease! What kind of thing is this where our Government is not held accountable for its actions? The project should be given a stop work order until Town & Country Planning has all the requested information. This is a major project and everything should have been in place BEFORE the work began. The MNR&L should be ashamed. This is why people have no respect for authority, because even a Ministry is doing what they want without the proper approval. Mr. Adams we the people are watching this closely. When the lil man want to add on a simple bedroom, you wont be able to tell them anything. The big bad bully because they do what they want when they want. Is this a cowboy town now???? ....sure, others come in an act as a law unto themselves...based on your argument, only BVI islanders are at Ballo. perfect case for a law suit. They did the same thing with Hans Creek and Beef Island. They ignored the standing law. Why is this acceptable? It also calls into question how the Cruise ship pier park moved forward. Even if there wasn't a smoking gun (which we will never know because there was no investigation), the behavior suggests possibilities of other improprieties. This lack of protocol makes Government look like a dictatorship lacking public input and lawful procedure. Shame! Has TCPD just become paper pushers with no teeth? They are complicit in this action by not stopping it. They are waiting for paperwork while the law is being broken. Shame Shame!! It's easy to cry shame on T &C department, but the reality is I believe Mr. Adams hands are tied. He is now going up against his a bull headed minister. I think he is treading lightly just to save his job. Don't forget NDP government is very vindictive. You disagree with any of their misbehviour and you are out on your head. The man have pickney to feed. why is there an option at all? they are disregarding the law. DO SOMETHING. Or is TCPD so afraid of angering the hand that feeds them? paperwork is just a formality. Then the government will do what they want anyway? This is no different to the SCB Harbour Project. Now I hope ayo see that the district rep for #7 is no different to district rep for #3! What about getting bold and locking up the Minister and Pre Sec? Had it been my project you would of had Conversation, Town and Country and even the minster himself coming to stop me from building my lil shack but its the same minster who pushing this project so who gonna stop him? They can spend a billion. 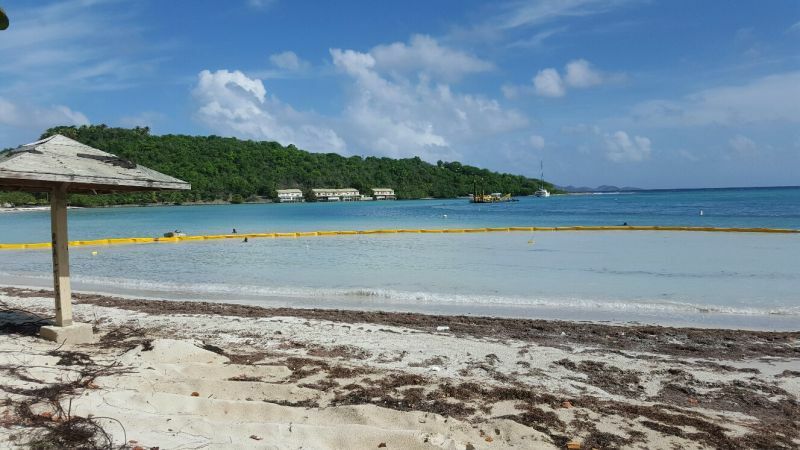 Brandy wine bay sea side will never become an entertaining or enjoyable beach. 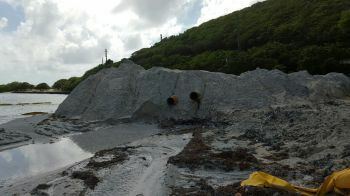 Maybe they should spend some of that money to fix the roads leading to smugglers cove beach with a few rest rooms. That would serve us better. Then use the rest of the money to build test rooms at beef island beach and put up a power poll and out let so power can be available at a cost for entertainment that would be of benefit to black residents. The NDP has destroyed this country and have the majority of persons in the BVI blind to this fact. Time will tell. What's happening at Brandywine Bay does not surprise me. What is taking place at the Port is equally distressing. The country is out of pocket but a $300,000. dollar unnecessary project is being undertaken to replace the Airport Project which has seen its last days. The Port is flat broke but the entire staff will be travelling to Anegada on a chartered boat to enjoy the lobster fess. This will include members of the "Board" which include a representative from the Ministry of Finance. Blow me down.